Who here loves to get a pat on the back? I do! I do! 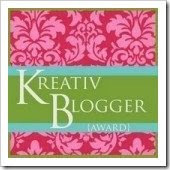 The ladies at Junk-Fest have bestowed this Kreative Blogger award on me. Do you know these ladies? It's blogs like theirs that attract me to this blog world. Junkers. Showing their finds and their creativity as a team. Good stuff. Check 'em out if you don't follow them already. 1) List 7 things you love. 2) Link to the person/blog that sent you the award. 3) Choose 7 more bloggers to pass the award to. 4) Comment on those 7 blogs to let the recipients know you've chosen them. So, there are the rules. Let's see how good a rule follower I am. 1. God is A#1. Hello? He's the coolest, ya know? Love Him! 3. Burt's bees chapstick rocks. 4. Music. It is necessary. Love it! 5. Nature. I love me some birds and bees and flowers and wind and sunshine, etc. 6. Shopping for stuff. I know. Who doesn't love that? But, I love buying for other people. I like picking out things I think others will love. 7. Free time. I love free time. It is so rare. And of course, I would just fill up the free time with activity. But, unscheduled free time is always a pleasure. Ok...back to the rules. I already did 2. Pay attention. Ok...now rules 3 and 4. Listen, while I like the accolades, they can be tiresome to folks who get them over and over again. No. I'm not getting them over and over again. But, a lot of my gal pals already have honors running out their noses. Everyone in my sidebar rocks! So, here's what I'm going to do. I'm going to tell you to spend some time looking at new blogs on my sidebar. Check them out. I'm betting I look at folks you don't. And then, come back and tell me the new person you found and love. Won't this be fun? who is fighting stage 4 breast cancer. "Renee is one human being who has made such a difference in the lives of many just by being. Her honestly, wit, intelligence, and grit are a tremendous source of inspiration. She can elicit raucous laughter and guffaws in her banter, and then turn right around and offer the most heartfelt, gentle words of wisdom and emotional support. She is a spreader of love,simple and true. And her love is infectious. "This is a brand new award and I have the pleasure and honor of spreading the seed, watching it grow. 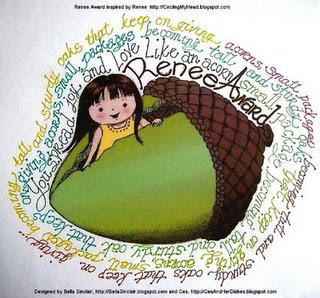 I hope it finds its way to those who are like Renee: the acorn, a small package becoming a tall and sturdy oak, giving more acorns, becoming tall and sturdy oaks, giving acorns..."
Man. That's enough to sober you up, isn't it? Cancer is no game. Nothing to laugh about. Renee is a fighter. She didn't ask to be. She, I'm sure, doesn't wanna be. But, she is living. One doesn't live at stage 4 without being a fighter. Go read her blog. Again, I'm rebelling. No 8 blogs being bestowed. Just a 2nd friendly reminder to spend some time cruising my sidebar. Check out someone new. See who entertains, teaches, inspires me. And come back and tell me who you discovered. Malisa at Moonlight Hollow and Cassie at Junk-Fest, thank you for thinking me worthy of these awards. I haven't felt very entertaining lately, so, to have you pat me on the back this week means a lot. Y'all are inspirational bloggers. Thanks for being in my world. Mindy it seems I have already arrived in the form of an award. I want to seriously thank you for stopping by my blog and offering me your prayers. They are a wonderful gift. Renee is a special woman. Good of you to send others over. Congratulations on the award and thank you for the sweet comment on my blog. This really is a whole 'nother universe we're in. Congrats on the awards! The recognition is wonderful but following all the rules can be like a homework assignment sometimes, huh? ;-) I already knew you were a non-conformist! Love you! Enjoy your weekend. It's going to be beautiful here and I'm psyched.